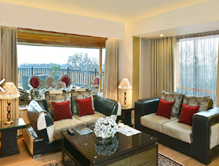 RK Sarovar Portico is the place to be at for visitors scouting for an unforgettable holiday experience in Srinagar. 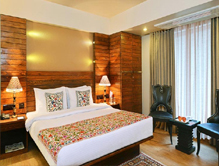 Located in the Residency Road/Lal Chowk, the RK Sarovar Portico Hotel provides an easy access to the visitors who want to see the enchanting tourist destinations such as the Lal Chowk, Shankracharya Mandir, Pathar Masjid, Royal Spring Golf Course and Tomb of the Mother of Zain-ul-Abidin that the city has to offer. 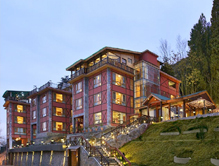 The resort boasts of breathtaking surroundings that really captivates the attention of the visitors. A stay at the resort will certainly provide you long-lasting memories. Accommodation The RK Sarovar Hotel provides excellent accommodation in Srinagar- it has 53 rooms and suites that are equipped with all the necessary amenities an individual can think of. The rooms also have attached bathroom, tea/coffee maker, bathrobes, reading lamps, direct-dial phone, rollaway beds and hair dryer. With every facility available, this resort is more suited to those people who love to see the beautiful tourist destinations. Dining and Resort Facilities With its top-notch services, the RK Sarovar Portico hotel in Srinagar offers an excellent dining experience in its Takht E Sulaiman restaurant. The dining rooms are magnificently decorated. The resort has an interesting menu that offers various kinds of cuisines such as the Indian, Continental and local dishes.